Many know that this was the novel Abbott was inspired to write after seeing Aly Raisman's parents watch their daughter compete. What is it like to be inside such a family, where everyone's hopes and fears are pinned to a single member and her solitary pursuit? 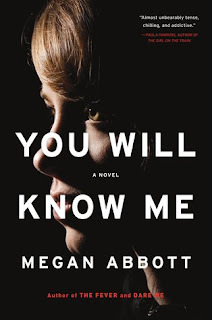 If that is the jumping off point, Abbott pushes it to extremes, adding an untimely death in uncertain circumstances to the mix to create a novel that is part family drama, part mystery. Devon Knox found gymnastics after a freak accident with a lawn mower when she was a toddler. Since then, her parents Katie and Eric have shaped their lives around getting Devon to the Olympics, dragging her amiable younger brother along for the ride. Their lives are spent at her gym, among the coaches and other parents. Yet the death of someone in the gym's orbit threatens to derail the Olympic dreams everyone in Devon's orbit has been pushing her toward. Where "The Fever" stood out for its portrayal of relationships, You Will Know Me focuses on Katie, just one member of the Knox family. It's structurally necessary to limit the information available to the reader and to better maintain the mystery. Yet, it also provides the basis for exploring the underlying theme of how well can you ever know your children and family. The focus on Katie enables the mystery, but constrains the ability to explore the depths of what different parents will do for their children and how parent-child relationships can vary greatly within a single family. Nevertheless, it's a compelling read, and particularly good on audio. Verdict: For fans of mysteries and family dramas, this is a solid, quick read. "You Will Know Me" by Megan Abbott, published July 26, 2016 by Little, Brown. Audio narration by Lauren Fotgang, published July 26, 2016 by Hachette Audio.